Benjamin Moore has 162 standard shades of white. Behr has 141 standard shades, Sherwin-Williams does too. Those are just the “named” colors, like Snow White or Ice White. You can also custom mix an almost infinite variety based off of them. Then there’s the size of the paint container, but more on that later. When I first see a quote request from a potential customer, almost always they want a shade of white. But what one person thinks is white vs what the next person thinks is white, could be two totally different things. That’s one of the main reasons that I suggest getting samples so that they can view the color in their actual spaces. Paint has undertones and those undertones can be any color of the rainbow. So everything from lighting, wall color, countertop finishes, shadows, etc. can have an affect on how a paint color can look in a room. Usually I show up with my color fan from Benjamin Moore and work with the homeowner to decide on a color that will enhance the space. Once we make a decision, I write down the details and have the customer sign-off on it. On the rare occasion when a customer wants me to exactly match something, it’s a little bit harder. We only use a specialized Benjamin Moore paint that is specifically for the type of work we do. 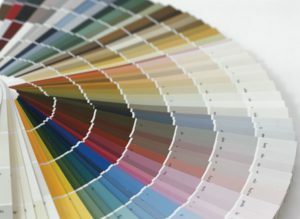 What that means is if you love a color that picked up at Home Depot or the Sherwin-William’s store, the paint expert at Benjamin Moore will pull up the other company’s recipe in their computer and 99% of the time the match is spot on. But there’s still that 1% where the color might be slightly off. If the homeowner has a piece of trim, or a piece of fabric the paint dealer can use that sample to try and make a color match. Lastly, there’s the homeowner who has leftover paint with the recipe still attached to the lid of the paint bucket. 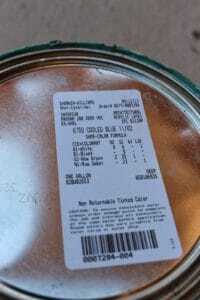 If it’s a Benjamin Moore recipe we’re golden because all the tints will match up perfectly. When it’s from another company, such as Sherwin Williams, Behr, Valspar, etc., the process involves a bit more finesse. To complicate that matter even further, if the quantity is different (for instance, if you have a 5-gallon recipe and you only need a quart or a gallon) then the recipe will need to be manipulated to accommodate the size difference as well. As you can see, it can be a daunting process to get the correct color. It was a combination of these factors that lead one of my customers to be unhappy. She was having her trim repainted and wanted her cabinets to match. Her painters were there when I first visited and I snapped a picture of the Sherwin-Williams paint formula on top of the 5-gallon bucket. The next day was when I found out that formulas differ depending on the size of the container. The guys at the Benjamin Moore counter spent about 20 minutes getting what they felt like was a perfect match and mixed up the gallon of paint. The following week my team painted the bases of the cabinets while I sprayed the doors in my shop. On that Friday I installed the doors, took the “after” photos and she seemed happy with the job. Because it takes the cabinet paint 30 days to fully cure to a rock hard finish, I sometimes hear back from customers who ask me to come back and touch up a couple of spots that got dinged. I’m always happy to do it and that trip is included in the price. So when I heard back from this job I thought it was going to be for touch-ups. What the home owner told me was that the color had changed in the 2 months since I had painted the cabinets. I was shocked by the news, so I went out to the house to see what could have happened. Although everything looked identical to me, she was convinced that the paint had “yellowed”. I explained that the paint I use is waterborne, not oil-based, and using a high-quality waterborne paint virtually eliminates yellowing (HGtv has a good article explaining the difference). I also explained that even traditional oil-based yellowing shouldn’t be noticeable in just 2 months. I encouraged her to not take my word for it, but to call the Benjamin Moore support line for confirmation. She called me back the next day and told me that although Benjamin Moore had told her the same thing, she was upset because the color of cabinets were not the same color as her trim, as she had requested, so she wanted me to repaint them. Since almost all of my business comes from referrals, I try to go above and beyond for my customers. In this case, I offered to repaint them for my hard costs – $450. Repainting would involve, removing the cabinet doors again, sending the crew back in for another 2 days, re-spraying the doors and drawers and the re-installation. Not to mention the cost of another gallon of paint. I also explained that trying to color match a second time was no guarantee that it would be any better, and could possibly be worse. I explained my situation to her as best I could, but she didn’t feel I was being fair and threatened to report me to the Better Business Bureau and sue me. Since that episode, I’ve learned to go into detail with customers about paint colors and what to expect. I also make sure they sign off on almost everything. Not only to protect myself, but to make sure they realize they are making decisions that are hard to change once the job is underway. I’ve also learned that you can’t make everyone happy. Sometimes there will be an issue that contractor and customer can’t agree on. 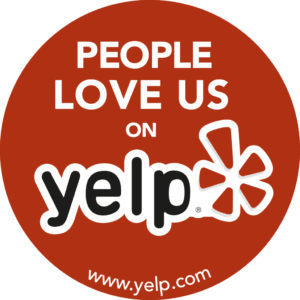 In the age of online reviews, everyone will have some bad reviews. In fact, my husband reminds me that a company with zero negative reviews are the ones that seem fishy. I figure if a product like the iPhone can have 11% of it’s reviews be 1 star then I’ll be ok.